Traditional Indian long shirt is hand printed with natural dyes. 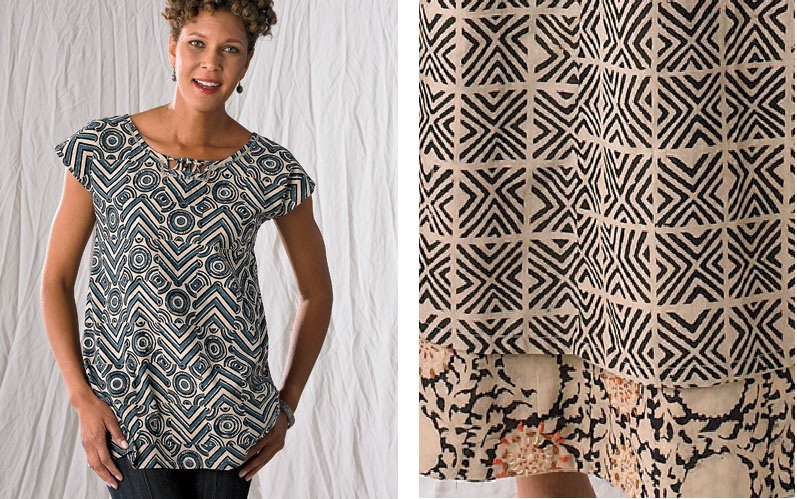 Round neck, 3-button closure and three-quarter length sleeves. Side slits and side pockets for ease. Wear with Salwars or jeans. Kalamkari is a hand block printing technique that uses vegetable dyes on cotton fabric. The word “kalamkari” is derived from the Persian word ‘kalam’ meaning pen and ‘kari’ meaning craftsmanship, and together the word means ‘to draw with a pen’. Very intricate designs are drawn onto fabric with the help of bamboo reeds using vegetable dyes. But for products of daily use, like apparel and home furnishings, blocks are used to create the patterns. The designs are so intricate that the block placement is critical in ensuring that the design remains accurate. The unique nature of this natural dyed fabric makes it look better with every wash. This ‘pen craft’ is heavily influenced by Hindu mythology and Hindu gods and goddesses like Krishna, Brahma, Ganesha, Shiva and Parvati are depicted on the fabrics in shades of green, yellow, red, blue and black. The processes involved in this art are very interesting. First, cotton fabric is whitened in a solution of Myrobalan nut powder and buffalo milk and then dried in the sun for a couple of days. The Myrobalan acts as a mordant to fix the natural dyes on the fabric. Fermented jaggery is then mixed with water to form a black solution- this is applied with a pointed bamboo reed to form the outlines of the designs. The dyes are obtained from roots and leaves of plants along with mineral salts of iron, tin, copper, alum, etc., which are used as mordants. Repeated dying, washing and resist dyeing with wax produce up to five colors on the fabric- and the fabric itself can be undergo up to 20 washes to produce one design! 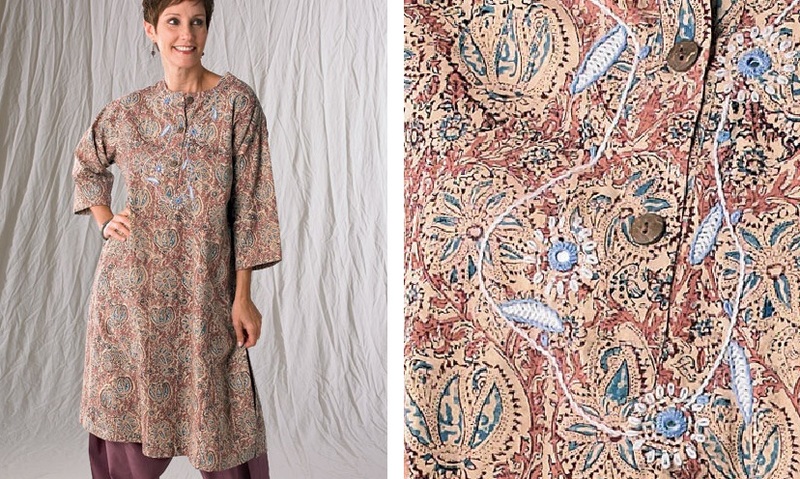 This textile printing technique traces its origins to the south of India but samples of kalamkari fabrics have been found in excavations in Cairo, Greece, Central Asia and Arabia- most probably carried there by traders centuries back.